Courtney and Scott are the cutest couple! 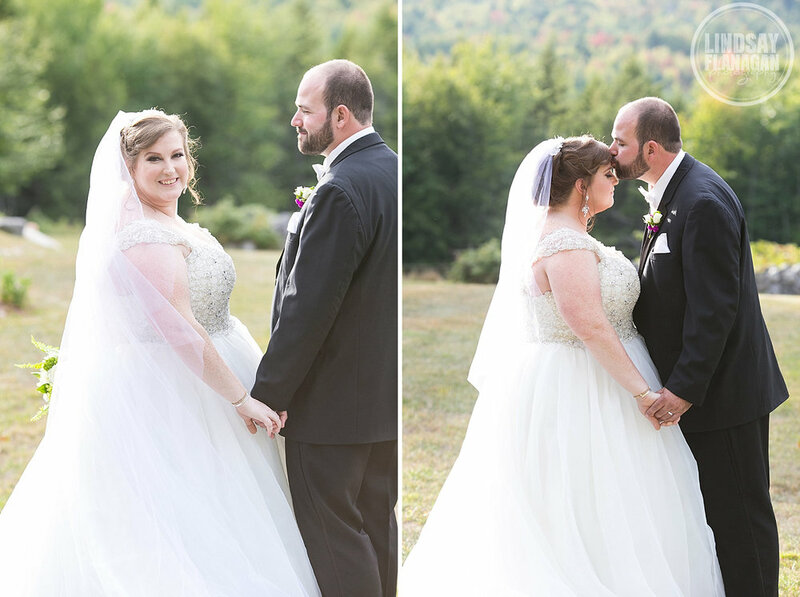 They were married at one of my favorite venues, The Stone Mountain Arts Center in Brownfield, Maine. 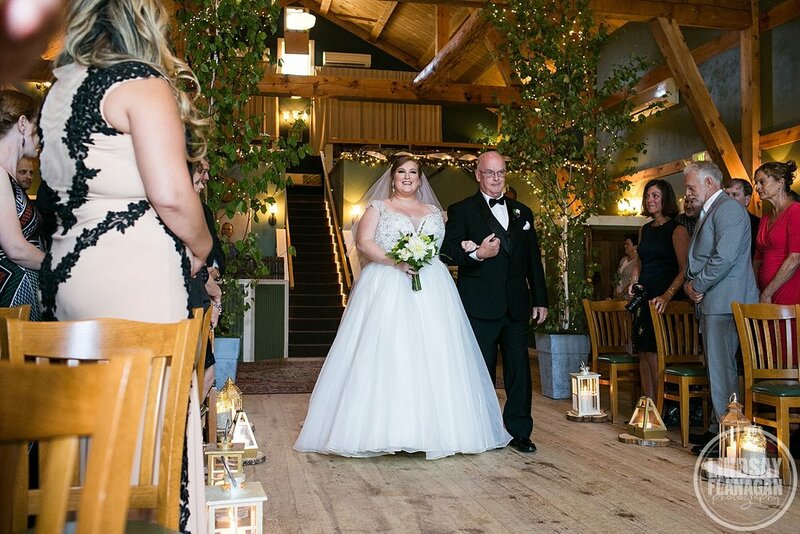 It's a gorgeous country setting with a beautiful, rustic barn - one room with a stage for the ceremony and dinner, and another space just down the hall for drinking and dancing the night away. 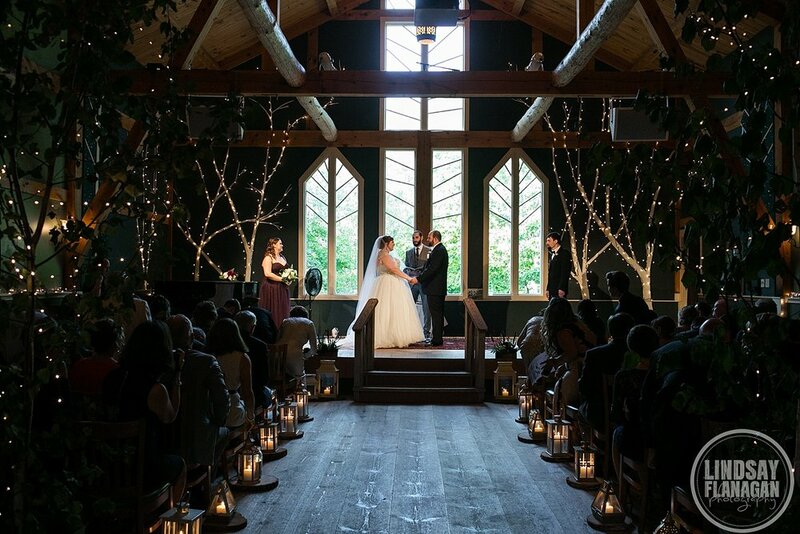 It's always filled with twinkly lights that create a warm, cozy feeling during your wedding reception. The morning of Courtney and Scott's wedding, I met up with Scott first and photographed him for a bit while he got dressed for his big day. 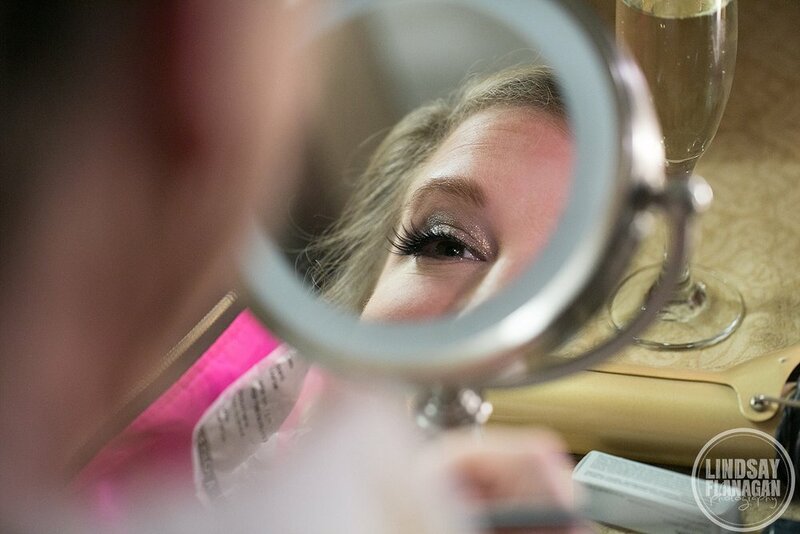 Next I met up with Courtney to photograph her getting ready. 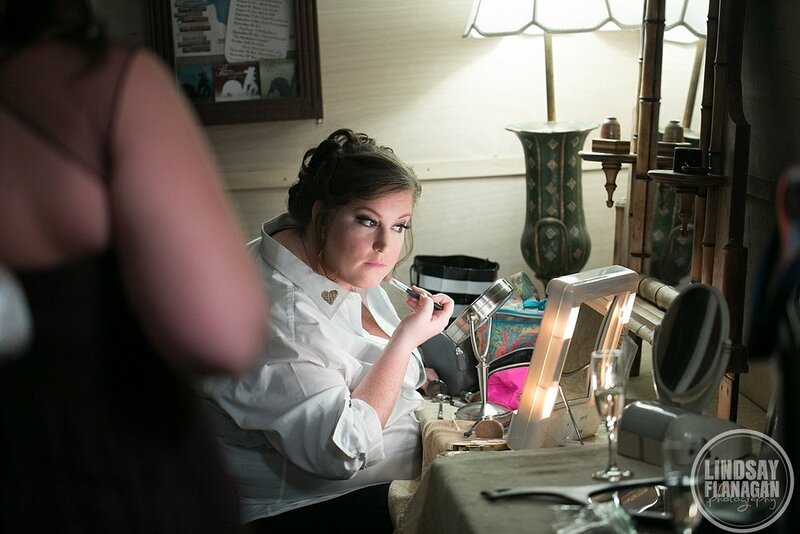 Courtney is a gifted in the art of planning a wedding, decorating, makeup and loves all things shimmery (as do I!). When I saw her engagement ring and her amazing shoes, my jaw dropped. Courtney told me she wanted something a little different for her engagement ring and she got what she wanted - I have never seen another one like it! 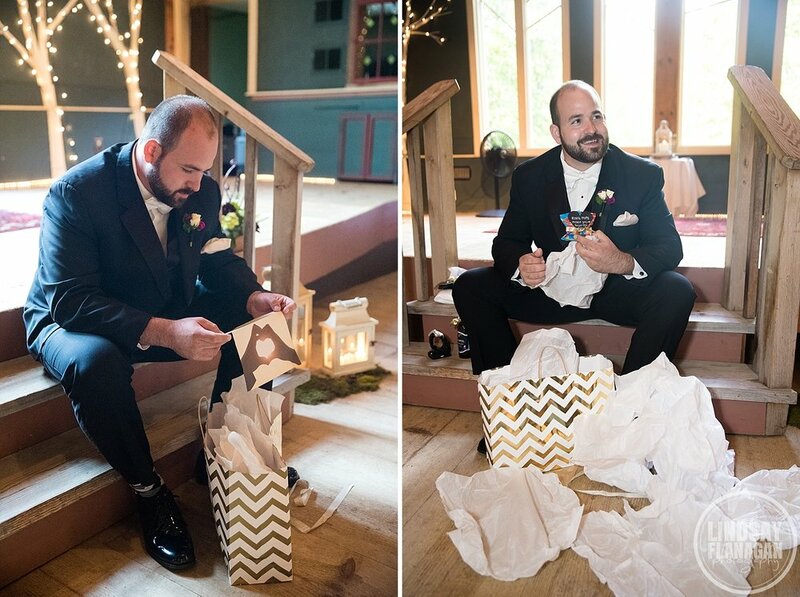 Before Scott and Courtney walked down the aisle to see each other for the first time, they exchanged gifts. Thanks to my awesome second photographer, Eric McCallister, for capturing the images of Scott below. 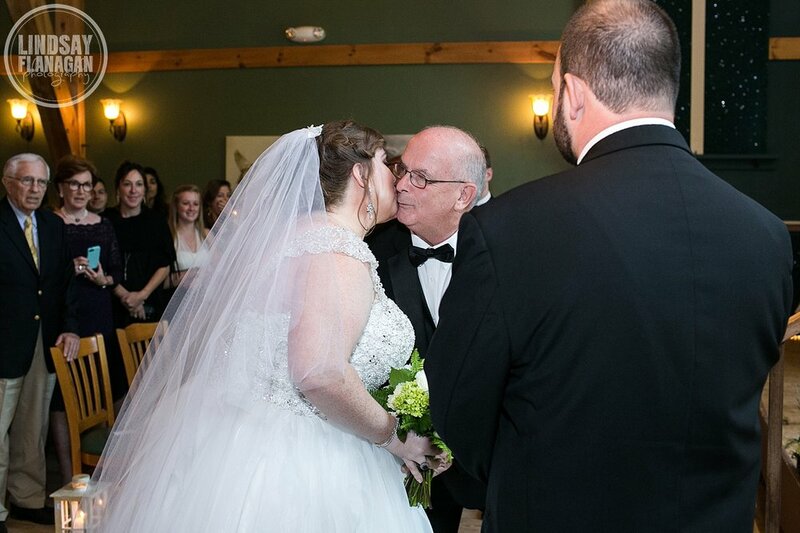 Courtney and Scott were married by a friend of theirs, making the ceremony even more special. The couple also read their own vows and Scott surprised us all by doing a dramatic dip-kiss after they were announced as Mr. and Mrs. for the first time! After the ceremony, we stepped outside for portraits. 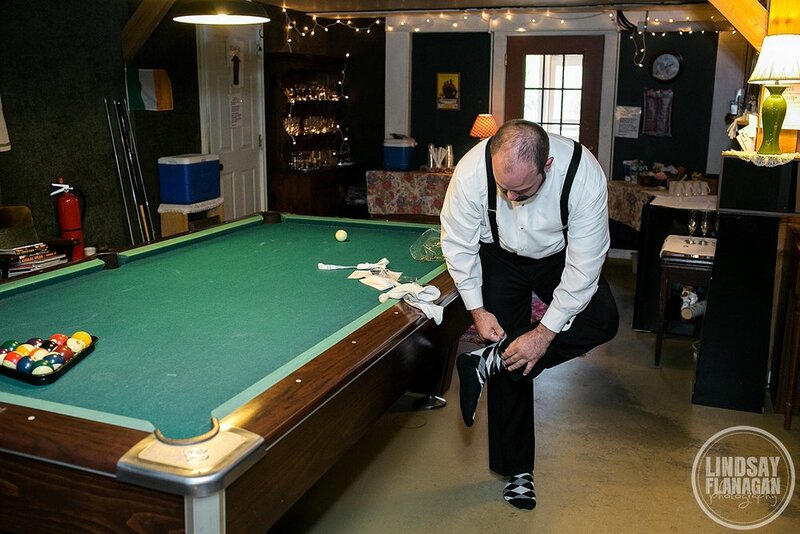 Courtney and Scott chose to keep their wedding party small, including only a Maid of Honor and Best Man. 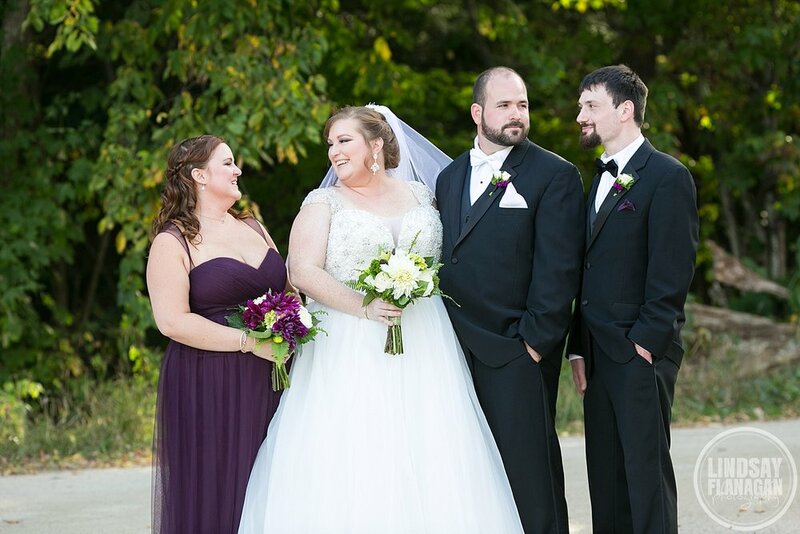 Courtney's Maid of Honor wore a beautiful plum purple gown and had a bouquet with purple accents to match. 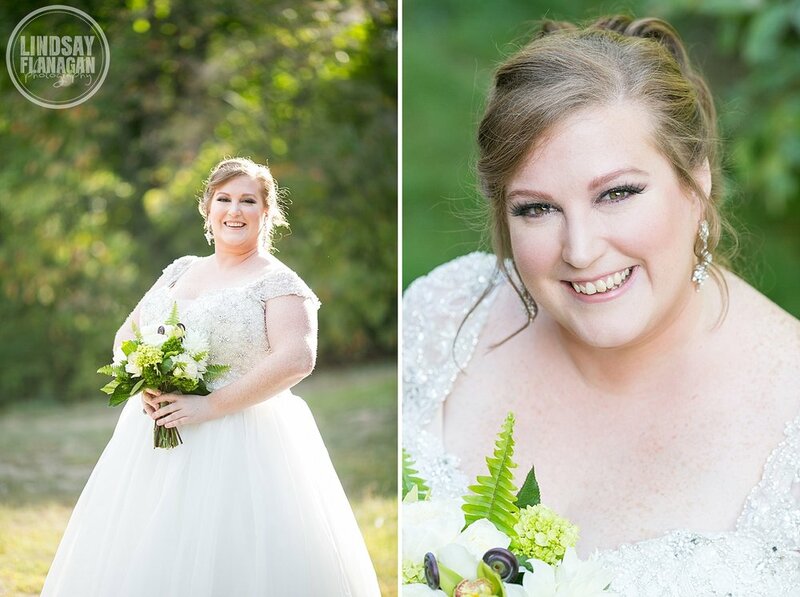 For the portraits of Courtney and Scott, Stone Mountain Arts Center works with a local resident that allows brides and grooms to come up the hill to their yard for portraits. They have a gorgeous view of the mountains. 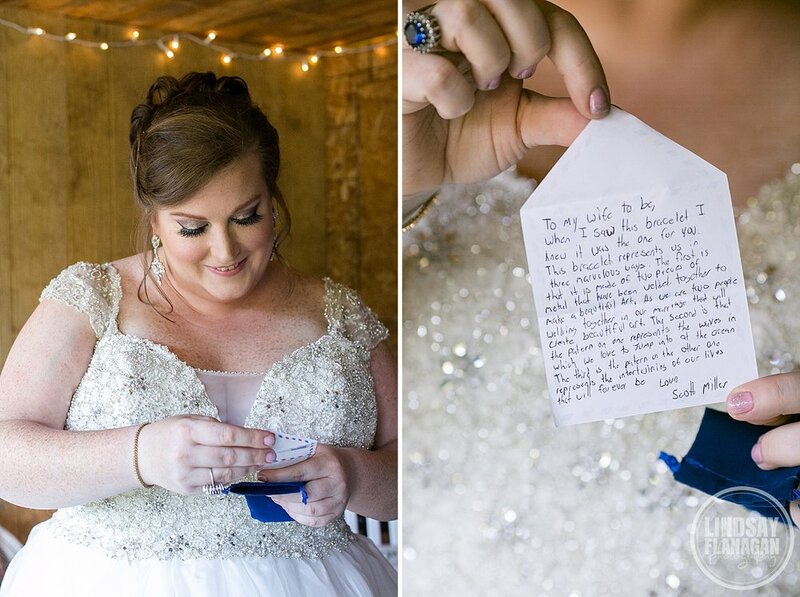 Courtney has amazing attention to detail and put together most of the rustic decor on her own. 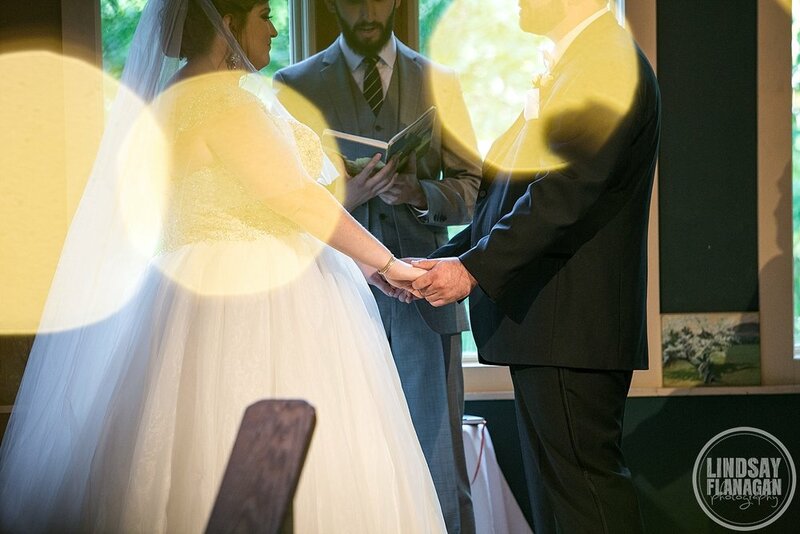 After Courtney and Scott were announced into the reception, they went right into their first dance. 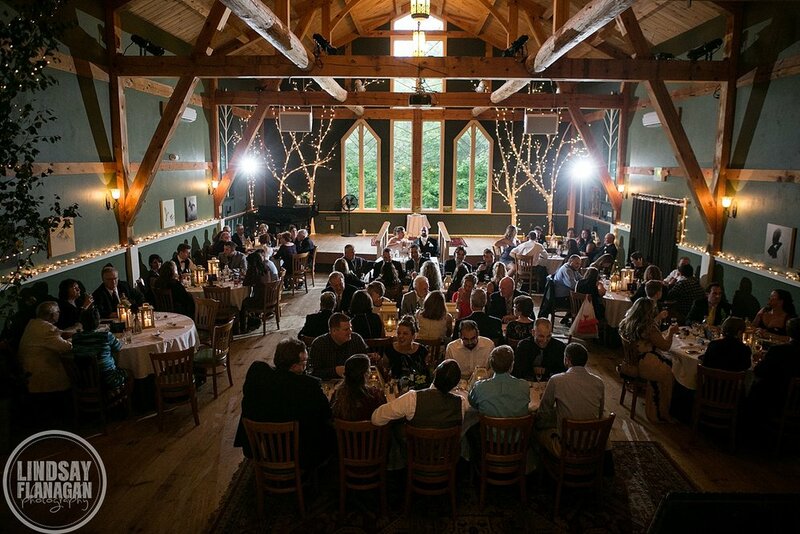 I love how Stone Mountain Arts Center has the couple's guests surround them during their first dance. It makes the moment feel more intimate! SMAC also divides up the reception - hosting the dinner (with really amazing food by the way) in the same room the ceremony is held in, and the reception in the main bar area. Courtney and Scott decided to have a small cheesecake for their wedding cake, artfully created by the Vintage Baking Company. It was accompanied by other treats as well as cookies for guests to take home at the end of the night. 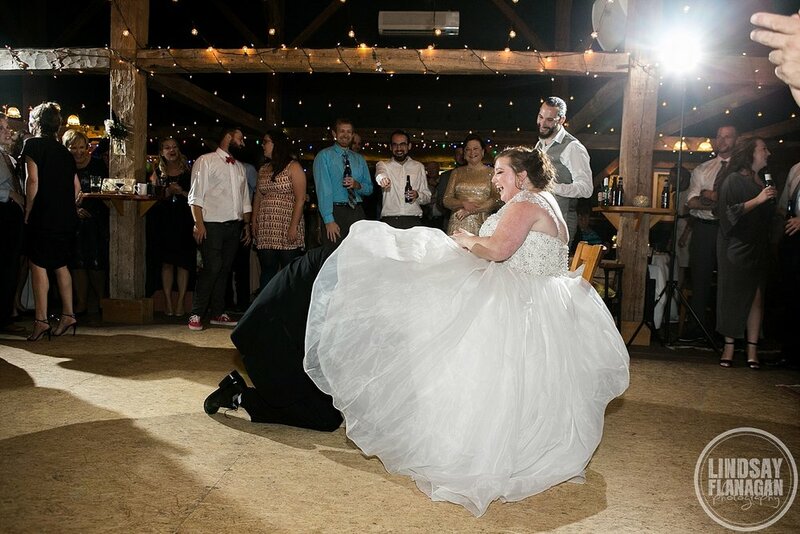 Not all of my couples choose to do the garter and bouquet toss these days, but they are always fun to photograph. 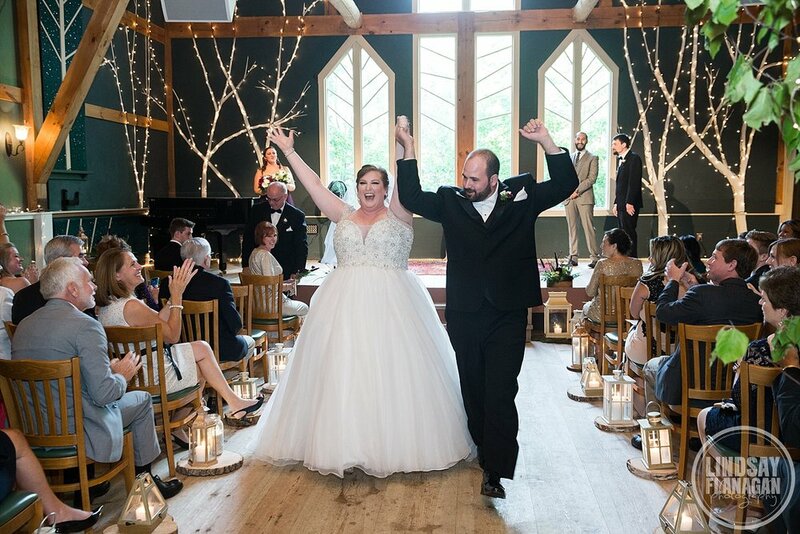 Courtney and Scott danced the rest of the night away with their guests and had a blast! 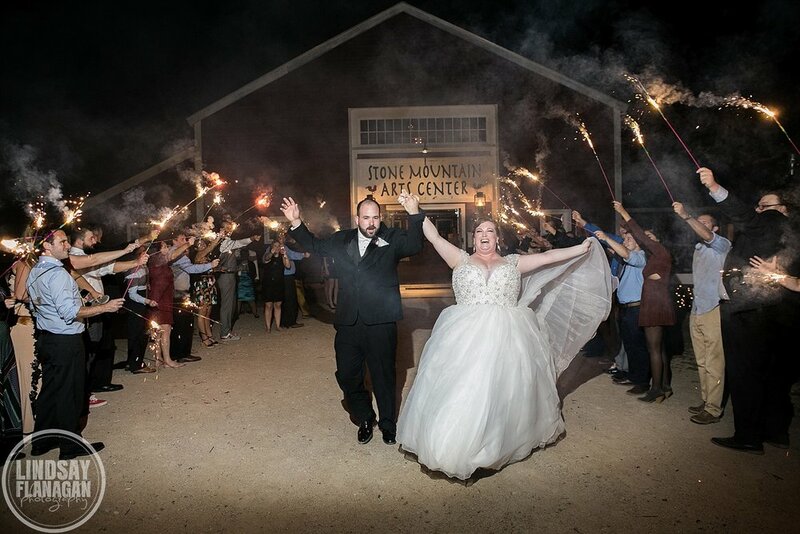 They ended their wedding day with a sparkler exit and one more portrait outside beneath the stars. 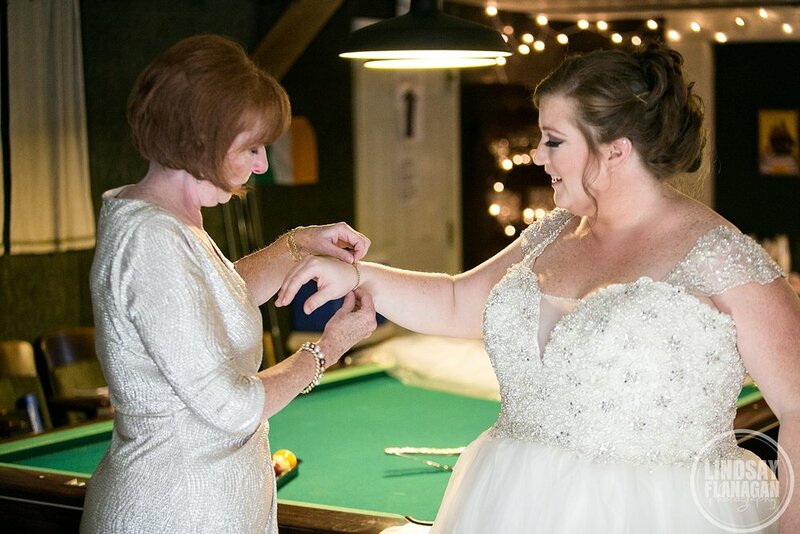 Thanks to the many vendors who helped make Courtney and Scott's wedding day so special!